We are manufacturer and supplier of high-qualityLightning Arresterfrom Delhi, India. OurLightning Arrestercan be widely used in various organization. TheseLightning Arrestercan be customized in nature. The principal of operation for ESE terminals is to create an upward propagating streamerearlierthan conventional air terminals or other objects on the earth by collecting and storing ground charge during the initial phase of a thunderstorm development and emits strong and consistent upwards streamers to intercept leaders. Lightning Arrester provides protection against lightning strikes on site. 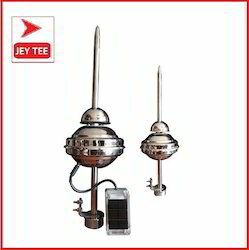 JeyTee Power Plus provides BAKIRAL Arrester that offers better lightning protection and withstanding multiple strikes. Copper Lightning Arresterprovides protection against lightning strikes on site. We provides Lightning Arrester that offers better lightning protection and withstanding multiple strikes. 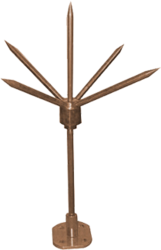 Copper Spike Lightning Arrester is a pipe made of copper and used as part of lightning safety to protect tall or isolated structures from lightning damage. It is also known as Conventional Type Copper Lightning Arrester.